" than before to make ends meet. We notice too that more often than not "the traditional job"
is still the most consistently available employment. We need to support ourselves but at the same time we want to find work that stimulates our passions, interest and self esteem. While paying the bills we want to put a little aside for those rainy days which we seem to be having more of lately. The difference between individuals who are successful or not is the ability to take appropriate risks with unwavering follow through. Gary Preder from Oak Harbor works at three jobs each week. Today he is driving a school bus filled with visiting students coming to perform at our middle school's band concert. During his four hour wait he trades stocks via the internet on a lap-top computer. He will spend an additional hour or two each day reading and doing research on the market and new options. 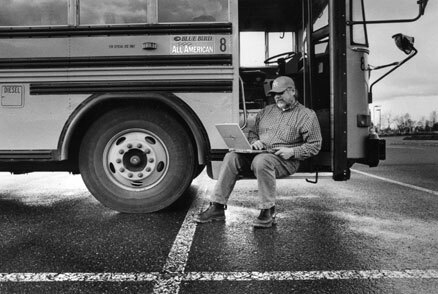 When he is not driving a school bus he is logging and investing in land developments that he feels will eventually sell favorably. Gary takes risks everyday because he feels everything worthwhile is worth taking a risk for.